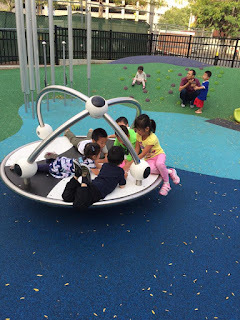 Linda See responded to my Great Taste post regarding the playgrounds in Chinatown and I felt like her pictures and comments deserved their own post. "You should bring him to play at the gate in the summer. In the evenings, there are at least 20 - 30 neighborhood kids on any given night playing together. Some bring their bikes and scooters and others (like my kid) bring toys that they all share for a few hours. Once in a while we end up with someone else's toy when we go home, but it's not a big deal because everyone knows everyone (by face, not name!) and you know you can just return it the next night because it's a regular crowd." "It isn't really a formal playgroup - everyone just goes outside in the summer evenings to get out of their stifling apartments. Plus the gate is the only big open space where the adults can sit and the kids can run around and play. I would say 90% of the kids live in the neighborhood and the other 10% are kids whose grandparents live in the neighborhood and watch them until their parents pick them up after work. More Mandarin speakers than Cantonese although I also hear 福州話 and 台山話 quite a bit amongst the regulars. 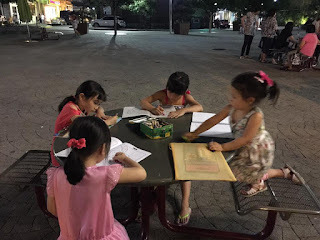 You can also tell which kids are old enough for school or not because they will speak English to each other if they go to school, Chinese if not." "(My Daughter) has played with the same group of kids on a regular basis for the past 2 years since she learned to walk - but we probably only know 1 or 2 of their names. Names are not important to these kids. " "These are from the end of the summer / early fall so you don't see quite as many kids as in July. Even at 9 pm in July, there will be at least 20 kids still out there." "This is from the summer. 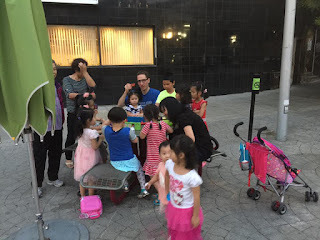 Note that dads are somewhat rare (I assume many are restaurant workers so are not around after dinner hours, but I've never asked any of the kids or their moms and grandmas) so the kids always flock to Ryan (my husband) when he is there. Chinese moms are a dime a dozen so no one cares about me. " 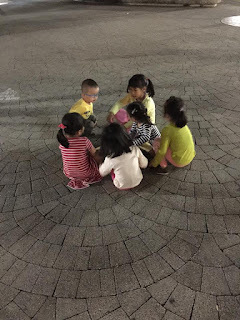 I had been thinking of how the group JP Moms, a powerful online list serve, developed from some of the moms at the Brewer and Burroughs street tot lot wanting to stay in touch with each other. Could such a group develop from these get togethers in Chinatown parks? The Facebook or QQ group would have to have a Chinese component. But just such a group of moms would actually become a real force for change. I mean politicians go to the powerful family organizations banquets in Chinatown as well the Festivals. But did you know that they go to the Tot Lot in JP? They also come to the Curley school events. Because they are looking for organized groups that will vote. What I am saying is the Moms in JP are as powerful as some of the organizations in Chinatown. Maybe Linda See is the leader Chinatown needs on that front. With regards to the last playground shown, here is some progress on it. I believe this stone table is supposed to be a ping pong table. This is the Park where children play. This is an emergency call box and a water fountain. That is going to be a big deal in the summer. In fact that is one problem I have always had with Chinatown Parks in the Summer. What if I run out of water? Where do I fill up? Then again I bought juice boxes or filled up at Moh Goon. There still needs to be work done, but by next summer it should be ready. Of all the playgrounds in Chinatown, I think this is the safest and cleanest. It's across from Mass Pike. 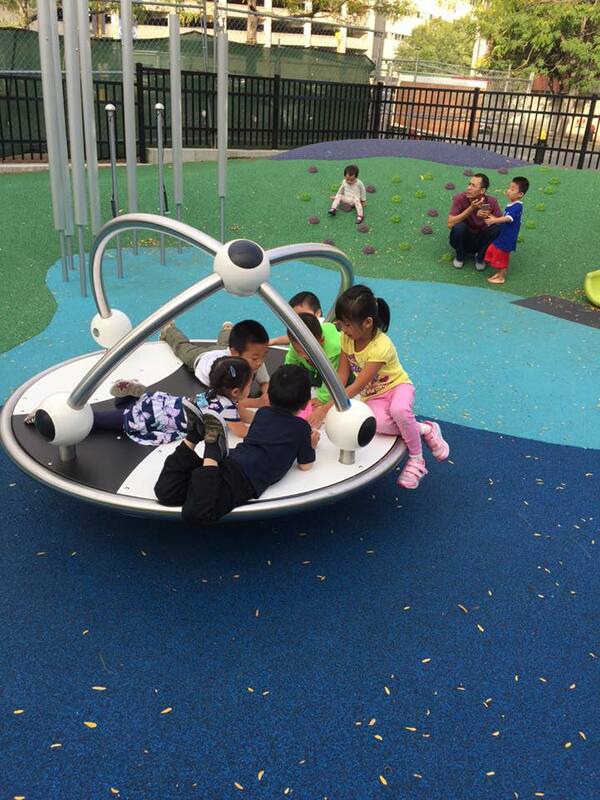 Maybe this could be the park that a Chinatown Moms group comes out of. The other park is good too, except for it's proximity to the highway. This one is actually gated in. Did you go to Red Oak?